→Cutting Your Dog’s Nails: How Important Is it Really? Cutting Your Dog’s Nails: How Important Is it Really? Today I have a guest blogger by way of an impromptu video. Dr. Leslie Woodcock DVM, is a long time friend of mine (for more than 20 years). She has been our Team Canada veterinarian at most of our international events (WAO, IFCS, FCI) for the past five years. Dr. Leslie is the former owner of Woodcock Veterinary Services, a clinic that specialized in rehabilitation for dogs post surgery or post-injury and helping dog owners with injury prevention. Leslie has also been there every step of the way during Encore’s recent health problems. Her assistance and support has been nothing short of amazing. Last year Dr. Leslie was at our place evaluating dogs at a workshop when I asked her to give a little lecture on nail trimming for performance dogs. It was a fascinating presentation. 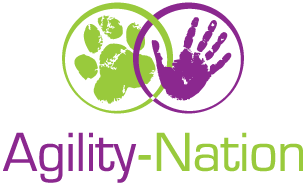 In summary; short nails are a key to our dogs rebalancing around an agility course and are critical in our geriatric dog’s long-term health. This presentation is a part of a three-part series I am currently running in my newsletter. If you are not yet a member of my newsletter sign up with the form on the top right of this page and you will be! 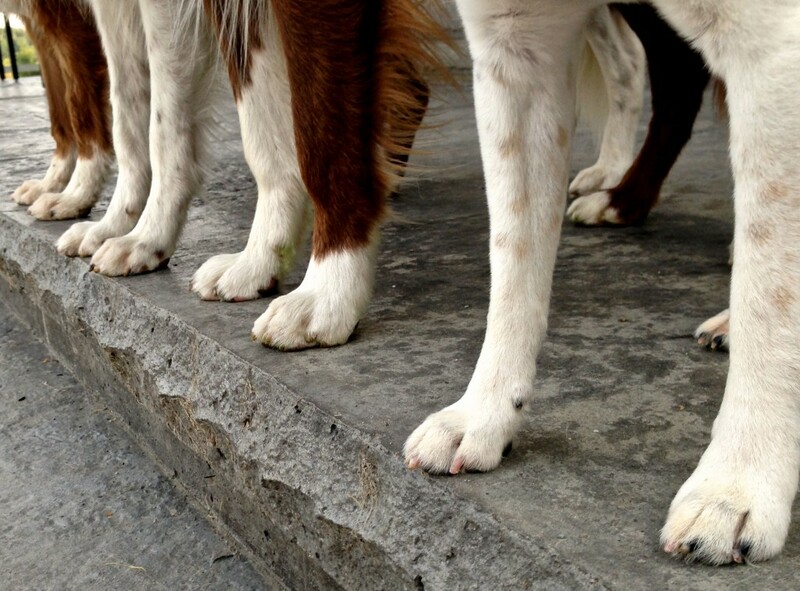 Can you name which set of paws belong to which of my dogs? From left to right . 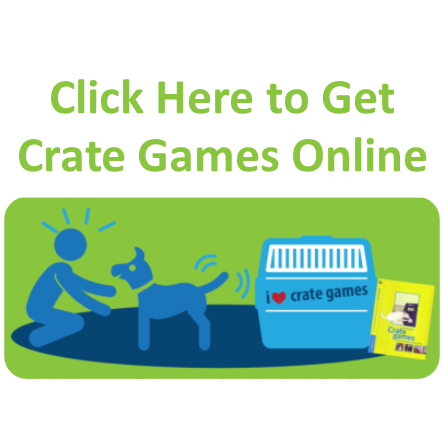 . .
Dr. Leslie suggests that our goal should be to cut our dog’s nails short enough that you can not hear them on your tile floor (when I can hear my guys I know it is time to cut nails!). In order to get the nails this short without hurting the dog (or making their nails bleed), your goal should be to get the “quick” (or soft bit that supplies blood to the nail) to recede. Most people when cutting nails try to cut directly across the dog’s nail (as in the diagram below). However, as Dr. Leslie recommends the best way to cut your dog’s nails without hurting them AND get that quick to recede is to cut the sides of the nails on angling back. Cutting nails this way it becomes easier to get your dog’s nails shorter without hurting them as it isn’t YOU the takes off the bottom bit of the nail it is your dog’s normal everyday wear and tear. I don’t know if my diagrams are perfect but Dr. Leslie’s 14-minute lecture sure is, so make sure you listen to it! Take a look at these before and after pictures of nearly 17-year-old Buzzy. On the left is Buzz before a nail trim, on the right is him after. Now I never let my dog’s nails get long (as evident in the picture above of four of my dog’s standing at the top of the stairs (Buzz opted out of that picture)). So the differences in these two pictures will not be as dramatic as they could be if Buzz was more of a “typical” 17-year-old dog with claws so long they are starting to curl under the pads (poor dog). But if you look closely you can see the length or angle of Buzz’s paws appears to change slightly from the picture on the left (before his nail trim) to that on the right (after his nail trim). It could just be the way he is standing (both of these pictures I just “caught” Buzz standing) but to me, it appears he is also distributing his weight differently between these two pictures. Dr. Leslie’s talk is a real eye-opener, be sure to leave her a comment and let her know your thoughts! Today I am grateful to my friend Leslie Woodcock whose commitment to learning more about how to help dogs is surpassed only by her love of them.